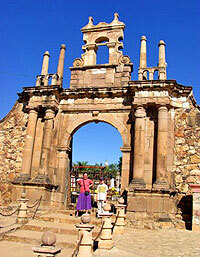 Founded in 1655, El Rosario held the status of Sinaloa's most important mining village for nearly 250 years. Located about 50 miles southwest of Mazatlan, El Rosario is the birthplace of famous Latin singer Lola Beltran, and the town has erected a small museum in her honor. Rosario is famous for it's beautiful altar inside it's church - which you'll see on this tour. On this very interesting cultural excursion, you'll see multiple rural villages in rural Mazatlan, and take a peek inside the past of the famous Mexican town of Rosario. You'll see how the locals live, and get a taste of the local culture, as well as visit some of the areas most well-known landmarks, as your expert English-speaking guide shares his knowledge of the area. Visit the village of El Huajote, where you can see the natives making handmade pottery and furniture! Arrive at El Rosario, where you'll see the church and it's famous golden altar, a museum, the city hall, and a local market! Stop for an optional lunch at the home of famous Latin singer Lola Beltran, now El Tiro de San Antonio Restaurant! Drive back to Mazatlan along the Pacific Coast, where you will see the farming fields of El Walamo and Villa Union villages!